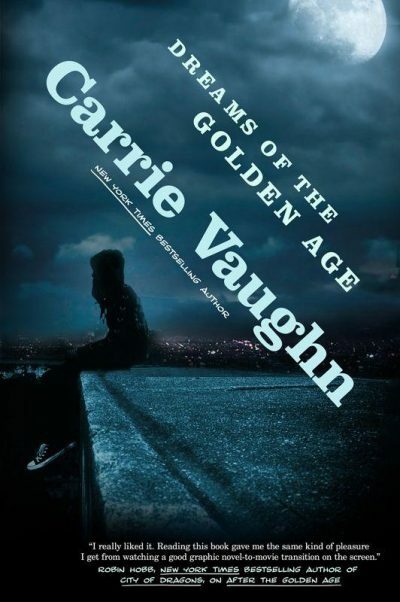 2014’s Dreams of the Golden Age is the second volume in Carrie Vaughn’s After the Golden Age series. Anna West is the grand-daughter of two of Commerce City’s greatest superheroes (Spark and the late Captain Olympus) and the daughter of Dr. Mentis (telepath). Anna’s mother Celia and Anna’s sister Bethy dodged the superpower bullet, but Anna was not so lucky. She has a bona fide extraordinary ability. Like her four friends (Teddy, Sam, and twins Teia and Lew) she has the makings of a genuine superhero. If only her power didn’t seem to be useless. Teddy (Ghost) can turn invisible and intangible (if only he didn’t get too flustered in combat to forget to become intangible). Sam (Blaster) can hurl laser bolts1. Teia (Lady Snow) can generate cold2. Her brother Lew (Stormbringer) controls weather. Anna’s psychic ability to locate every living person she knows sufficiently well seems … unimpressive by comparison. And she’s no longer happy with her code name, Compass Rose. Although Anna doesn’t appreciate it, she did inherit an ability from her mother, Celia, one that manifested a bit earlier than it did for her mother3. Anna has enough common sense to know that her group’s practice runs in the park are no way near enough preparation for taking on the criminal element. Even after Teddy’s first solo foray leaves him battered and bruised, the others are determined to seek fame and fortune on the streets. The disagreement divided the group in two: Teddy and Anna on one side, and Sam, Teia, and Lew on the other. Sam, Teia, and Lew opt for the direct approach: go out looking for trouble, zap trouble when they find it. Teddy and Anna, aware that direct confrontations could end badly, employ more subtle means. They exploit Anna’s ability to find people she knows sufficiently well (a condition she discovers she can serve by researching people) and Teddy’s ability to walk through walls to gather damning information on criminals. Anna tries to fly under parental radar (which can be tricky when dad is a telepath; at least he tries not to violate other people’s privacy). Hard to do when her mother is keeping tabs on everyone descended from the first superheroes, who were irradiated in a lab accident. As far as mom Celia knows, that accident is the sole source of superpowers. Celia is well aware that Anna is up to something, even if she doesn’t know exactly what. She can make educated guesses as to who is behind the mask whenever one of Anna’s friends appears in public. With the help of her ally on the force, Celia does what she can to keep the kids safe. Celia has a mundane superpower of her own: she controls the powerful West Corporation. She tries to steer Commerce City toward peace and prosperity, while fending off sociopathic developers and other such mundane villains. She must operate in public. She’s a potential target. Anna is warned by a costumed stranger (hunky but hopelessly ancient; twenty years old or even older!) that a new supervillain has come to town. The stranger has no idea who the bad guy might be, but the villain has a name: the Executor. The Executor operates through intermediaries to take over cities. His latest target? Commerce City. And that means taking the city away from Celia. Celia believes that she can list every single person irradiated and every one of their descendants. But Executor doesn’t seem to be one of them. Which means there’s another superpower source, one of which Celia knows nothing and against which she cannot prepare. Anna is convinced that her quintet is divided into combat types and useless subtler figures. Having played way too many superhero RPGs, I can say authoritatively that Sam (Blaster), Teia (Lady Snow), and Lew (Stormbringer) are what’s called in the biz Glass Cannons. They combine attention-getting offensive abilities with the bullet-resistance and bullet-dodging powers of an average teenager. Anna (Compass Rose) and Teddy (Ghost) know enough to sneak. Ghost can allow bullets to pass through him. OK, anyone can let bullets zip through their bodies, but Teddy can do it without being hurt. Mostly. Sometimes. The important thing is that big zap + no defences = a career that lasts as long as it takes to annoy a criminal with a pistol and half-decent aim. In fact, I’d put odds on Sam being the first one to buy it, because lasers are line of sight, which means it’s obvious who did the zapping. Also, of the five super-teens, he’s the least developed character. X-Man fans can think of him as the Thunderbird of the group. On top of that, the fighters seem to assume that antagonists will politely take turns. If there’s one thing I’ve learned from Villains & Vigilantes, Super World, Champions, DC Heroes, Big Eyes, Small Mouth, Silver Age Sentinels Icons, Mutants & Masterminds, BASH! and Masks, always target the mentalist first people are not that polite. B) Invest in decent Kevlar. A lot of this book is about trust issues, except when it’s about poor communication (and except when it’s about property-value threatening exchanges of energy and fisticuffs). The trust issues aren’t all that surprising, given that superheroes need to guard their personal information4. Trust issues also come up because the teens are chary of telling parents about their activities. This book took a lot of familiar tropes and combined them in a pleasant way. Not great literature, but a fun read for a slow afternoon. Dreams of the Golden Age is available here (Amazon) and here (Chapters-Indigo). 1: His laser bolts knock people over without super-heating any flesh — but he can also burn through stuff when he wants to. Comic book science. 2: Some comic book science treats cold as something that can be projected. A much smaller set treats cryokinetics as endless heat sponges. It’s not clear which of the two models Teia uses but frankly, I can only think of one small set of legacy characters who do it the second way … so my money is on the first option. 3: Celia was also a minor (non-powered) supervillain for a time. Or perhaps she is best described as a hapless minion. 4: Live-tweeting during combat is a bad idea, not just because it’s kind of a giveaway that the tweeter is the superhuman doing daring deeds. Even BlackBerry phones don’t stand up well to melting.